Although I was born into a world with televisions, computers and video game systems, I can still remember when my brothers and I played outside, riding our bikes and scooters, playing basketball until we were exhausted. 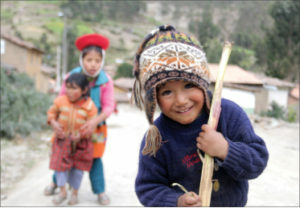 As I stood in Huilloc, a small village in Peru, with no cell phone service or Internet access, I watched the local children running around and realized how unnecessary technology could be. About 20 other students and myself spent three weeks in May studying abroad throughout Peru where we documented indigenous cultures. We started our trip in Lima, where about 10 million Peruvians live. Lima is full of insane traffic, a sea of pedestrians and buildings covered in advertising. Technology was definitely present. We were able to visit remote places as we traveled deeper. 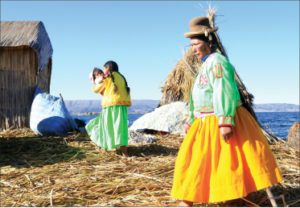 In Puno, we took a tour of Lake Titicaca and it’s islands. Our tour guide, Edgar, introduced us to their simple Quechua culture. The men played instruments while the women wove clothing in front of us. 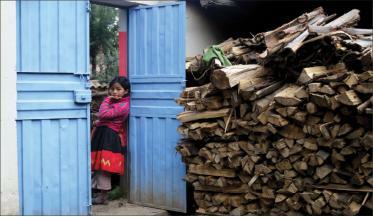 During our trip, we stayed five nights in a village a few miles up the road from Ollantaytambo called Huilloc. The main language in Huilloc is Quechua, but some men knew Spanish and some children were learning it at school. We stayed with different families. I stayed with a young couple who had a 1-year-old daughter. All the houses in Huilloc were made out of adobe, and the family cooked their meals without the help of electric or gas stoves and hand-washed their clothes. Not using my cell phone for that amount of time was great. I had time to clear my head and wasn’t concerned about what everyone else was doing or what I was missing out on back home. I had a totally different perception of time–no alarm clocks. When the sun rose, everyone got ready for work or school and everyone was outside in the evenings. The adults socialized and the children played soccer or flew their hand-made kites until it was dark. Technology wasn’t necessary. If you needed to communicate with someone, you would either walk to their house or wait until you saw them again. Electronic devices benefit us, but we can also end up living our lives through them rather than having real conversations and relationships. Time in the village showed me that it is important to put down your phone, laptop or controllers sometimes and spend time with mother nature, or as my new Peruvian friends say: Pachamama. Michaela Román viajo a Peru este verano con otros 20 estudiantes para documentar la cultura indígena en el país. Durante su visita, Michaela realizo como la tecnología no es necesaria. Algunas de las habitaciones llevaban satélites, pero nadie esta adentro, sino afuera. La familia que acogiò a Michaela no utilizaba hornos eléctricos o de gas y lavaban su ropa a mano. Ella tuvo una percepción del tiempo totalmente diferente al no usar un reloj. Cuando salía el sol, la gente se iba afuera. Si querían comunicarse entre ellos mismos, se presentaban en persona. Si querían entretenimiento, se juntaban con amigos. Michaela realizo que es importante dejar el celular, computadora o video juegos solo por un tiempo mientras convivía con la naturaleza. 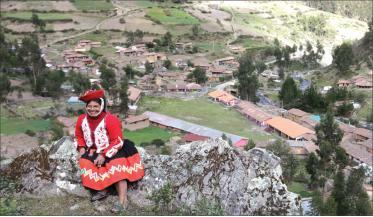 O como decían sus amigos peruanos: Pachamama.